Stuart Milligan reads this exclusive audio adventure featuring the Eleventh Doctor, Amy and Rory as they encounter aliens in America. November 9th, 1965. New York City is plunged into darkness, a taxi driver has bad dreams, and an invisible spacecraft hovers ominously above the skyline. As an extra-terrestrial disease sweeps the populace, Amy and Rory must sabotage the city’s water supply to slow the spread of infection, and a dying Doctor holds another man’s life in his hands. With the death toll rising, and his companions stalked through the streets by alien businessmen, the Doctor is forced to make a terrible decision. How far must he go to save his friends? 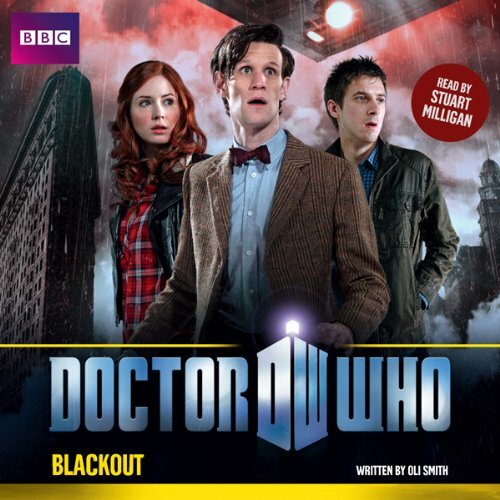 Written specially for audio by Oli Smith, 'Blackout' features the Doctor, Amy and Rory as played by Matt Smith, Karen Gillan and Arthur Darvill in the acclaimed hit series from BBC Television. It is read by Stuart Milligan, who played President Nixon in the 2011 TV episodes ‘The Impossible Astronaut’ and ‘Day of the Moon’. I believe that there was a good story in there somewhere, but sadly I had a hard time seeing it. The author wrote a weak story, I am sorry to say, which is unusual for this writer. The last few he wrote have been very good and fun to listen to. Also, the narrator was not the right one for a Doctor Who story. I understand that the setting for the story is in New York City USA, but the characters of Doctor Who are from the UK and the accents need to reflect that. Unfortunately the narrator did not seem able to perform a feasible Scottish accent (Amy), nor a believable British accent (Rory and the Doctor). That being said, it is a passable quick listen for when you are doing something around the house - like washing dishes - and don't want to have to concentrate too much on the action or the storyline. And the Doctor saves the world again! Where does Doctor Who: Blackout rank among all the audiobooks you’ve listened to so far? Doctor Who: Blackout is a great episode. Like all the crazy adventures the Doctor has, this one brings excitement to an hour of listening pleasure. What does Stuart Milligan bring to the story that you wouldn’t experience if you just read the book? The different voices that Stuaret Milligan can achieve brings the storyline to life. He brings stronger characters to the front, leading the listener through the tornado of a storyline. What did you love best about Doctor Who: Blackout? In this story, the Doctor and his companions face an unknown enemy with unknown weapons that seem to be making people go into their own.personal supernova. It was written exceptional well and the narrator was fantastic. The scene in the power room with Amy and Rory and their mysterious foes. Not really any particular part, just the whole book. New York is under attack! Not War of the Worlds style attack, but attack none-the-less. And the Doctor doesn't just want to fix problems, but needs to this time around. This story was a good, solid story that fit well into the Doctor Who universe. Nothing new and exciting about it, but certainly a fun story to enjoy. If you're looking for a classic or if you're looking for fun time travel paradoxes, this probably isn't the story you're looking for, but if you're looking to continue your adventures with the Doctor.